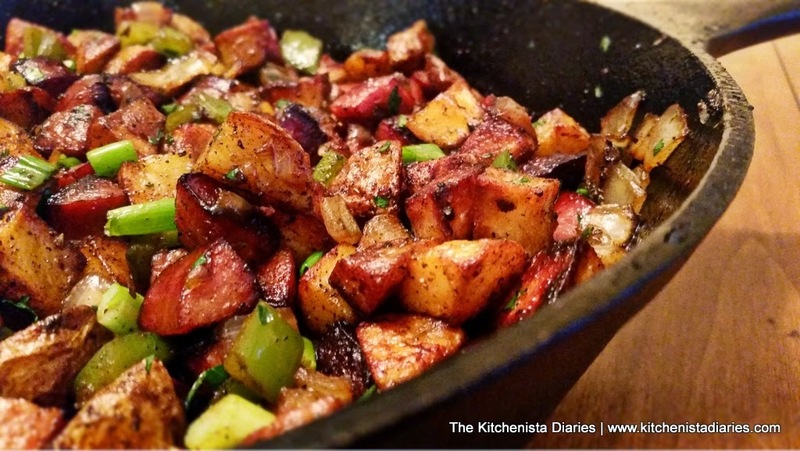 A great hash is an indispensable dish to add to your kitchen repertoire. Perfect for any meal of the day, it's relatively easy to whip up and can be adapted to almost any ingredients you have on hand. It's always nice to be able to make use of my cast iron skillet for a one-pot meal. 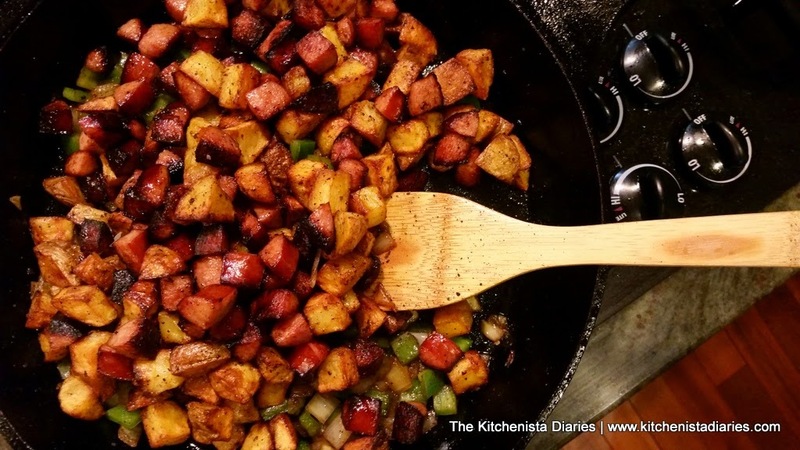 I've shared a couple hash recipes here, such as my Sweet Potato, Bacon & Apple Hash earlier this year and one of my early recipes, White Sweet Potato & Turkey Sausage Hash. 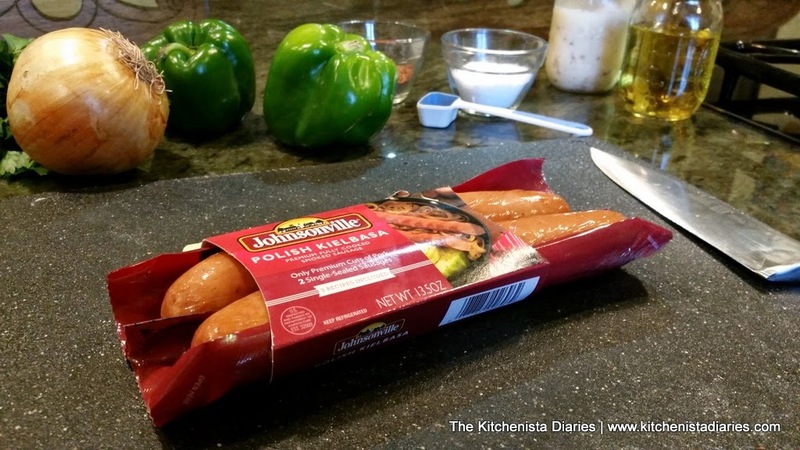 Recently, Johnsonville asked me to come up with a "kicked up classic" recipe to share using their fully cooked split rope sausage. 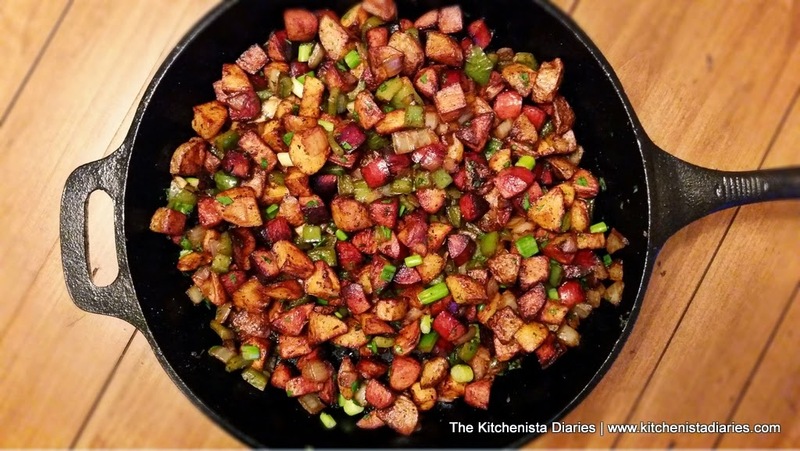 For this recipe, I went back to more of a traditional hash using white potatoes, smoked sausage and green peppers. It's a humble dish, but when you take the time to do something right the results can really pay off. I made use of Johnsonville's Polish Kielbasa pork sausage here, but honestly any of their varieties would work great in this recipe so by all means switch it up. What I hope you'll take away from the recipe is that good technique really pays off in this case to transform some relatively inexpensive ingredients. I took some lessons from Serious Eats' The Food Lab: How to Make the Best Potato Hash to refine my hash making skills and the results were awesome. I ended up with crusty potatoes, caramelized nuggets of smoked sausage, and crisp tender peppers and onions with just the right amount of seasoning to bring it all together. Just goes to show you that even something you've made plenty of times before can always be improved upon - my definition of a kicked up classic! 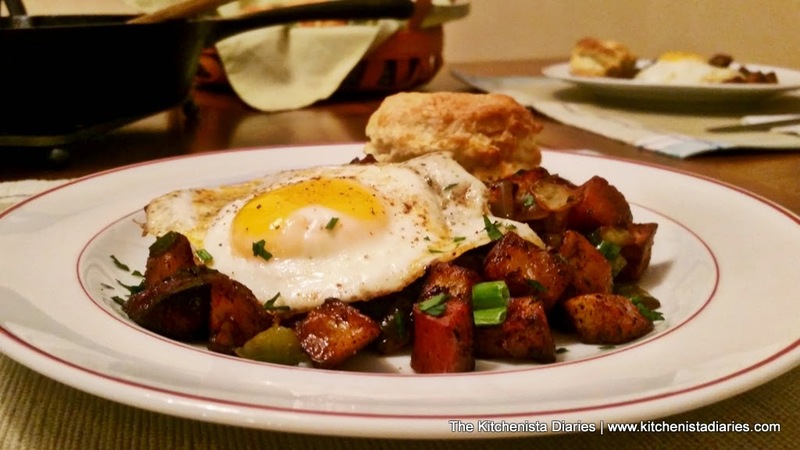 We enjoyed this Smoked Sausage Hash as part of a weeknight breakfast for dinner, also known as "brinner" in the food world. 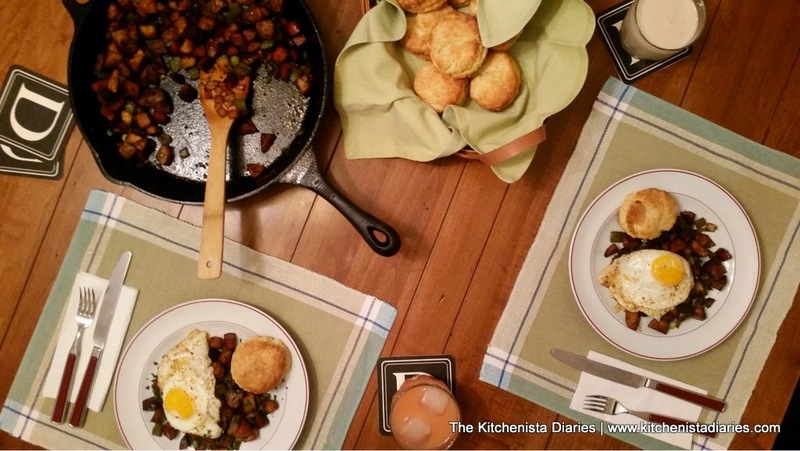 Fresh buttermilk biscuits and a fried egg were easy accompaniments, and I love how a cast iron skillet becomes the perfect serving dish for a rustic meal. Whether you're looking for something to serve at a casual brunch, or just need an easy cheap meal to get you through the week - hash is always your answer. Taking my notes from Serious Eats, the first thing I tackled was par-cooking the potatoes. After scrubbing well, I diced the potatoes into uniform chunks. That's important for even cooking later. You don't want larger pieces that are still hard on the inside, and smaller pieces that have turned to mush. I don't use the microwave often, but a steamer basket comes in handy for these tasks instead of heating up boiling water. Just toss the potatoes with 2 tablespoons of apple cider vinegar and a healthy pinch of salt. 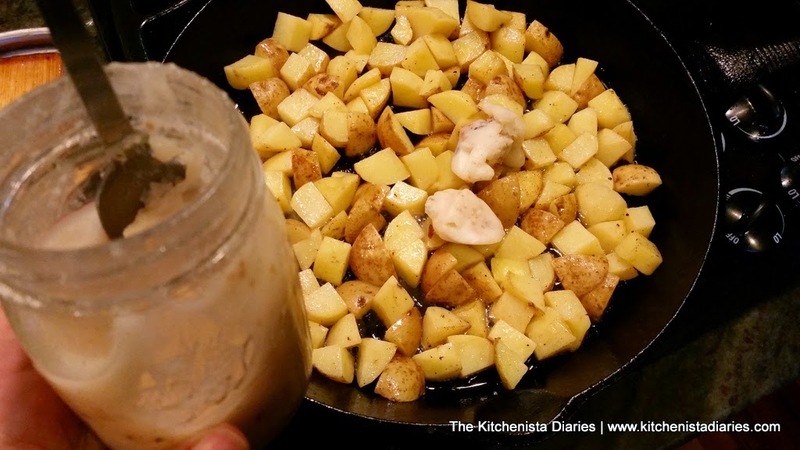 The vinegar adds some flavor to the potatoes and works to hold the structure of the potato together when it cooks, while allowing the interior to get soft. I steamed my potatoes for about 5 minutes; just enough to where a butter knife could pierce pretty easily. If you don't have a steamer basket, you can boil the potatoes in salted water; just add the vinegar to the cooking water. While the potatoes steamed, I preheated my cast iron skillet over medium high heat and started prepping my other ingredients. The nice thing about this hash is that there's plenty of time in between steps to chop and dice as you go, so you don't need to spend an extraordinary amount of time prepping before you get started. 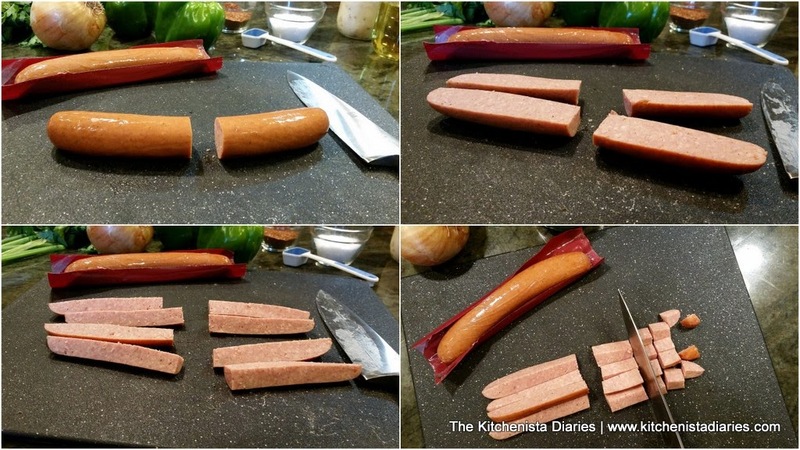 The easiest way to dice up your sausage evenly is as shown below. 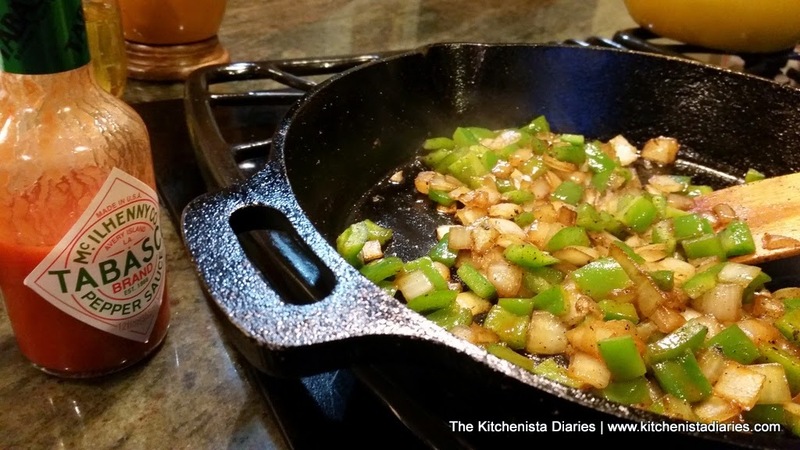 You'll end up with uniform pieces that will all cook at the same rate in the skillet. Add a couple tablespoons of canola oil to your skillet and brown the Kielbasa well. I do mean brown! Leave it to sear on each side for a few minutes at a time before stirring around. Take it all the way to the point that a deep caramelized crust starts to build on your sausage pieces. This is how you start to build real flavor - there is simply no substitute for time! 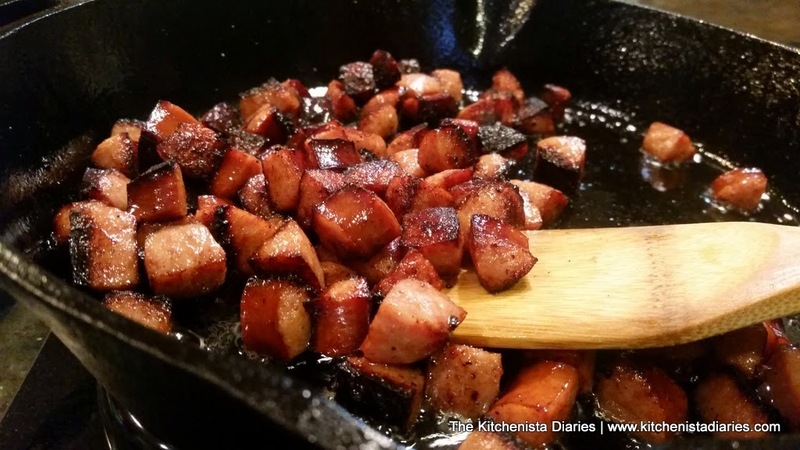 When your Kielbasa is crisped up, remove it from the skillet. I suggest just having a large paper-towel lined bowl off to the side because you'll add the potatoes to it later as well. It's nice to soak up a little extra oil that was needed in the cooking process, hence the paper towel. 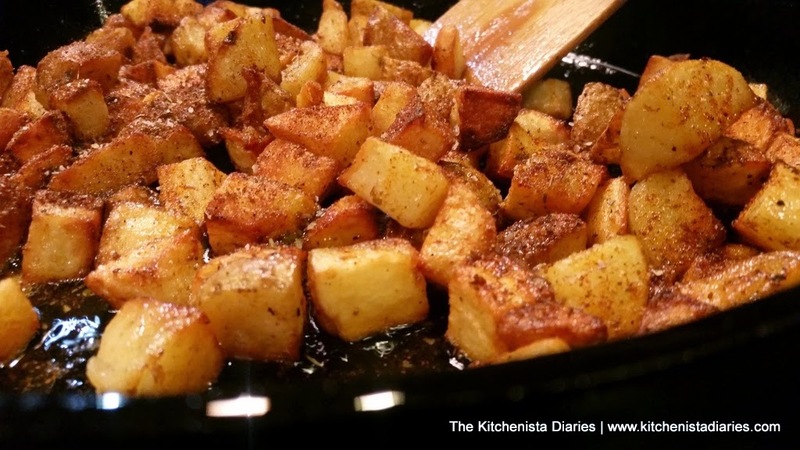 Add the remaining 1/4 cup of canola oil and your diced, steamed potatoes to the skillet with a pinch of salt. Also add some bacon fat. This is a secret weapon in the kitchen. Any time I can, I save rendered fat from cooking bacon and store it in a mason jar in the fridge. It's an easy way to add a ton of extra flavor to your dishes, especially potatoes (of any kind.) If you don't have bacon fat, butter works too... but bacon fat will take your hash to another level. 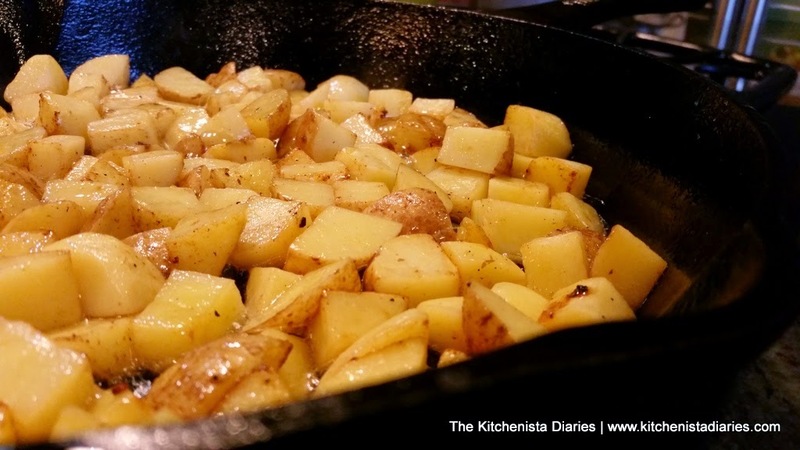 That might seem like a lot of fat, and it is, but it's really necessary for the potatoes to properly crisp up in the skillet so you end up with a flavorful crispy hash. You're essentially pan frying them, and just be patient because it's going to take some time - about 20 minutes or so. Just like the sausage, leave the potatoes alone for a few minutes at a time to allow one side to sear before tossing them. 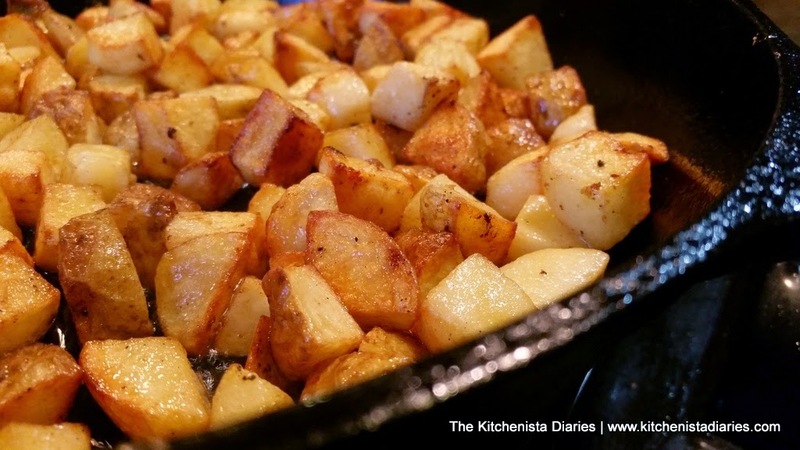 You'll get to a point about 10 minutes in where the potatoes are golden brown, but not necessarily crisp. Don't stop here! Rookie mistake. Just let them keep browning. Do you see the difference above? At this point, the potatoes are crisp to the touch and soft inside. I gotta say, I don't eat white potatoes all that much so it always seems like such a special treat now when I do. Maybe that's what excites me about this hash and why I wanted to take the time to do it right. Now you can season the potatoes with some of your bbq spice rub. I wanted to keep this recipe simple, so it's really okay to use whatever blend you have on hand. Try to find something with a smoky touch to it, like smoked sea salt and smoked paprika. I used a couple tablespoons of my spices, and then checked the seasoning to adjust how much salt I needed. Keep in mind, the sausage will be added back into the skillet which adds some salt as well. 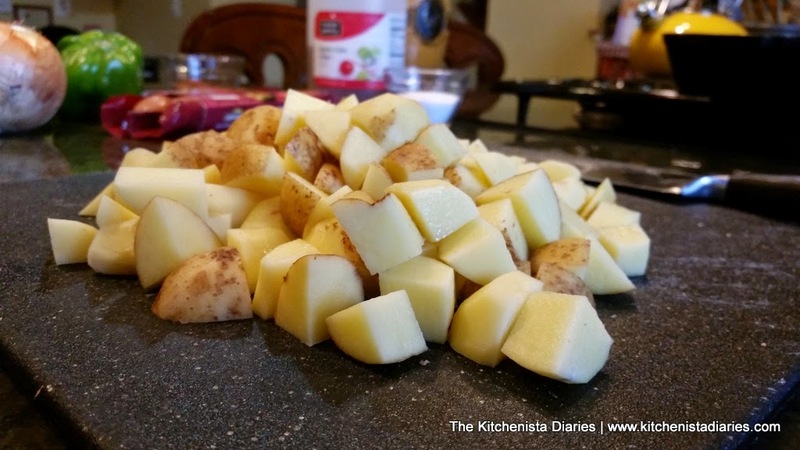 After the potatoes are seasoned, allow them to finish crisping up a few more minutes. They should be the texture of crispy steak cut french fries. Delicious. 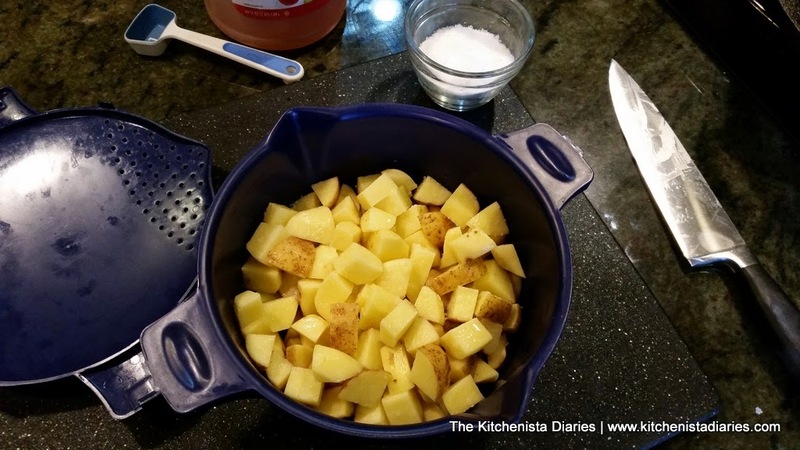 Transfer your potatoes to your bowl and set aside. 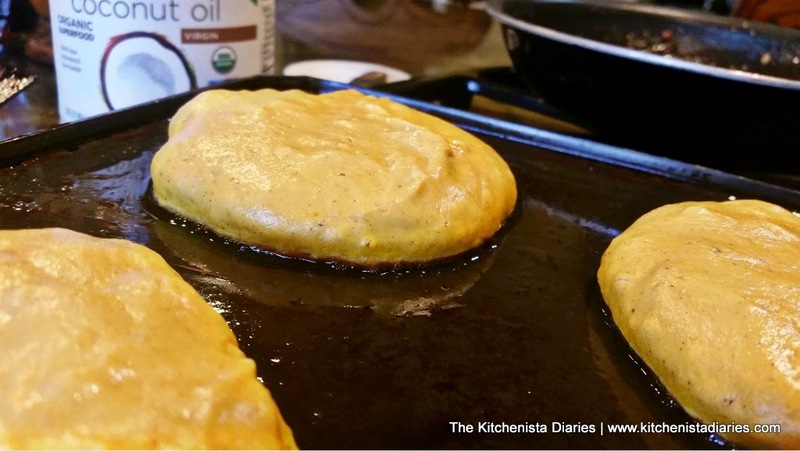 You should still have a decent amount of oil left in the skillet. If not, add a tablespoon before throwing in your diced onions and peppers and a pinch of salt. 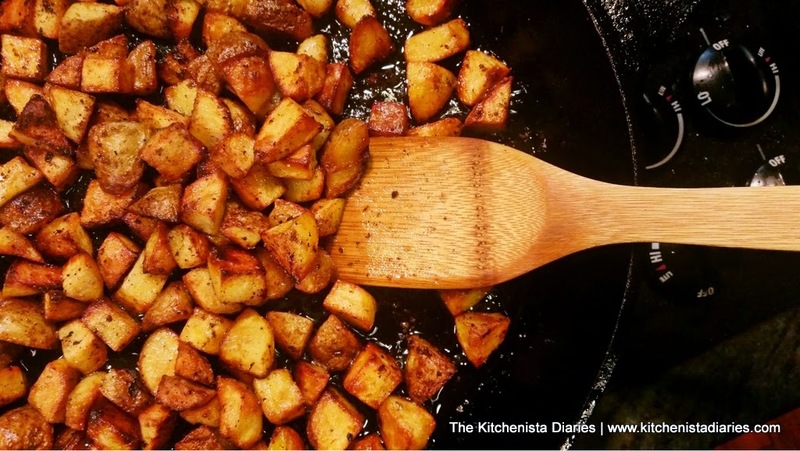 As veggies soften and release some of their moisture, use your wooden spoon to scrape up any browned bits on the bottom of the skillet so you get all of that flavor into your hash. 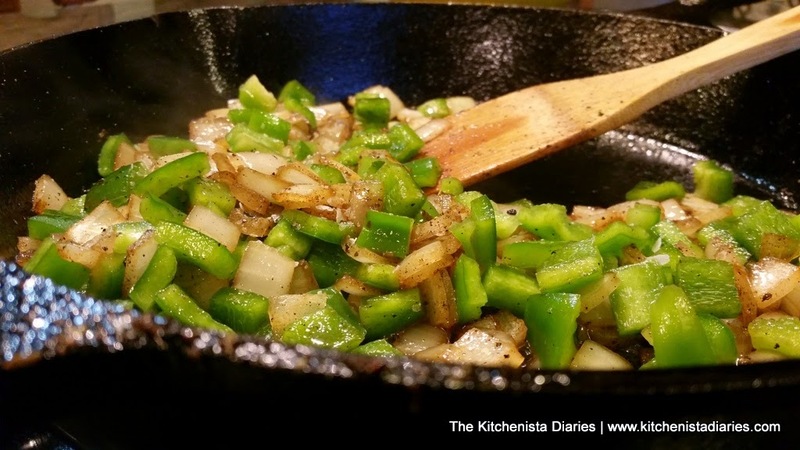 With the high heat of the skillet, this should only take a few minutes - you want crisp tender peppers and onions. They'll still have a little bite left. You're just about done now! Splash some hot sauce in there to add a kick - as little or as much as your taste desires. 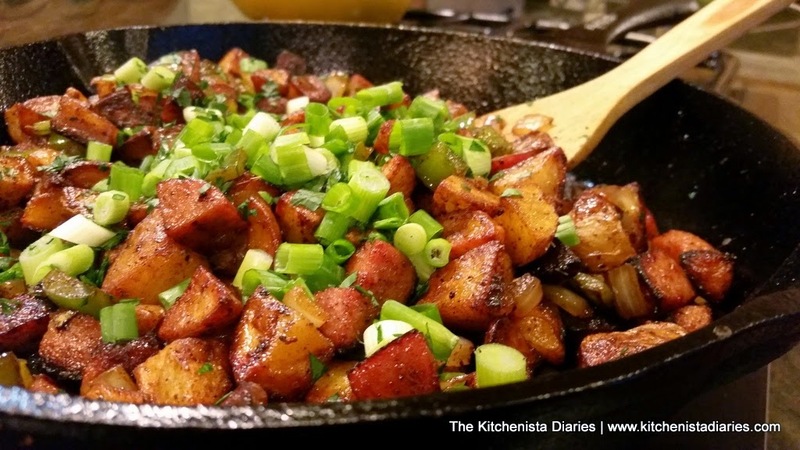 Return the potatoes and Kielbasa to your skillet and toss to combine everything. Make sure you check your seasonings too and make any adjustments necessary. To finish the hash off, stir in those sliced scallions and chopped parsley. I love adding a bit of freshness back to my dishes for the best balance of flavors. There you have it... a beautiful, crispy smoked sausage hash. This is ready to serve immediately while it's hot! My favorite accompaniment for hash is a fried egg on top. I wait until my hash is completely done cooking, as the eggs only take a minute to fry up. In a smaller nonstick skillet over medium heat, add a couple tablespoons of butter or bacon fat. 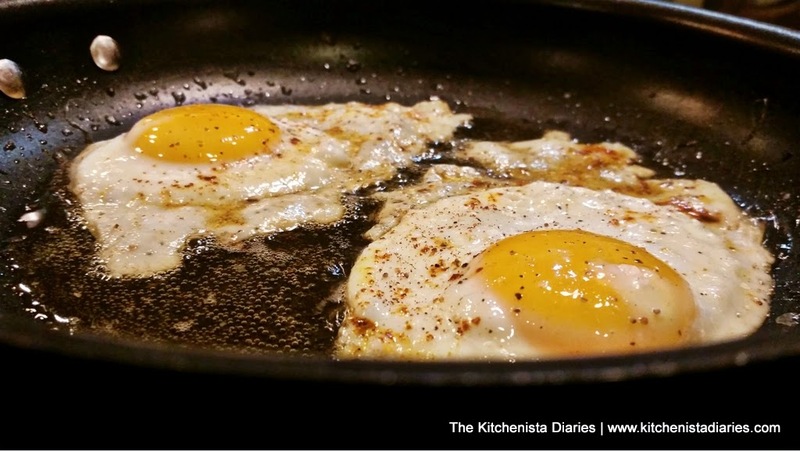 When it sizzles, crack in your eggs - I stick to one or two at a time for this size skillet. Once the whites set, I turn the heat down to low and cover the skillet. 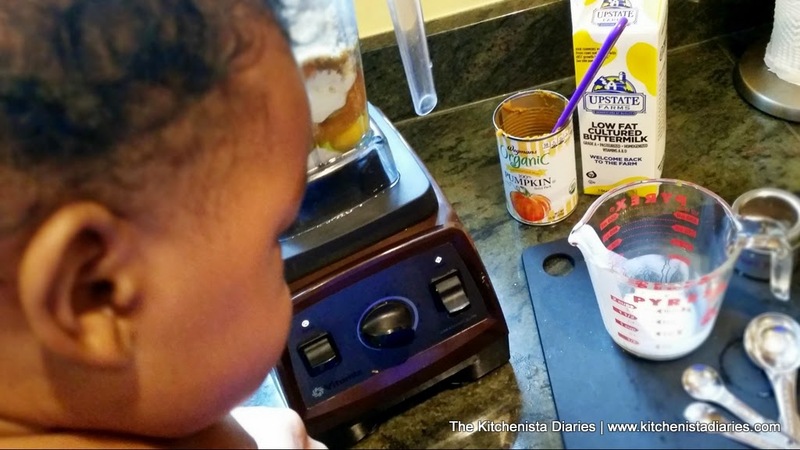 This helps the top of the egg whites to finish cooking faster, leaving the yolks runny. When the eggs are just about cooked through, I season with salt & cracked pepper, and use a spoon to baste the egg whites with some of the hot butter or bacon fat. If you can handle a little bit of multi-tasking, homemade buttermilk biscuits are also easy to pull off while your hash is frying up. 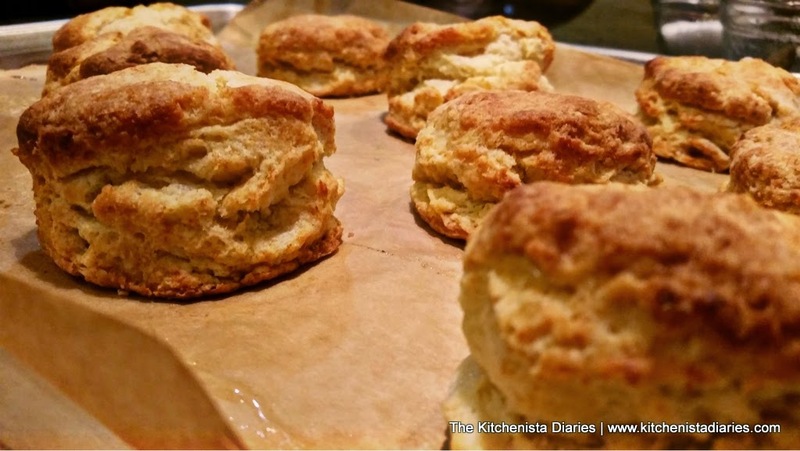 The best thing to do is prepare your biscuit dough ahead of time and arrange the cut biscuits on your baking sheet. Slide it into the freezer and let it hang out until you're ready to bake. This can be done as far in advance as you need - if you'll be freezing them for more than a couple hours, transfer the unbaked biscuits to a ziploc freezer bag after they harden completely. 20 minutes or so before your hash will be done (let's say while your potatoes are cooking) you can brush the biscuits with butter and pop them into your preheated oven. 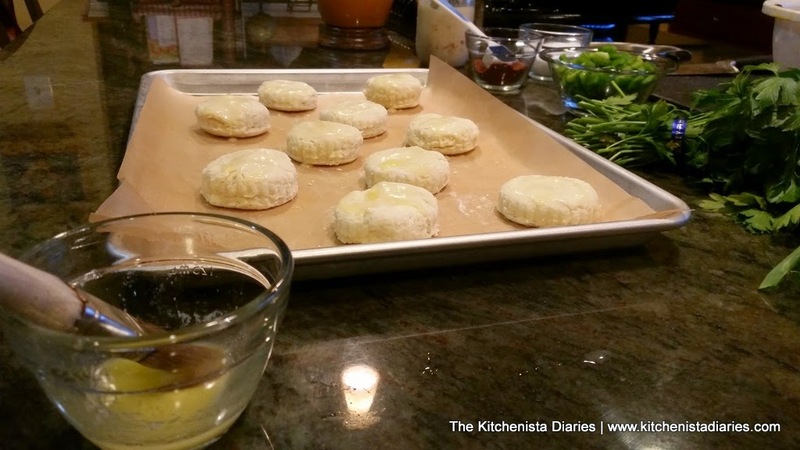 At around the same time your hash is done, you'll also have fresh hot buttermilk biscuits ready to serve as well! This will make your life so much easier if you're serving up brunch or another big breakfast, because the messy part of making biscuits was done ahead of time. Smoked sausage hash, fried eggs and a biscuit! Nothing like some nice country homecooking once in awhile - this is a comfort food classic, done right! Disclaimer: This conversation is sponsored by Silk and I received compensation for this post. The opinions and text are all mine. 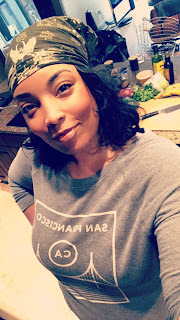 I'm taking a short break from the recipes for this post! I was elated when Silk Almondmilk asked me to join the #TasteSilkAlmond campaign in efforts to challenge people we know to taste the goodness that is Silk Vanilla Almondmilk! Because of the ingredients I've been keeping on hand for recipe testing, whole milk became a staple in our fridge in the past year. 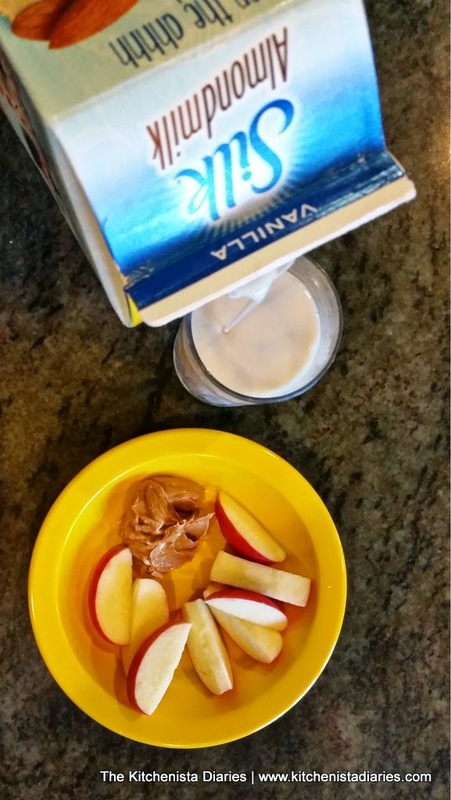 With a growing 11 year son who seems to plow through milk these days, making the switch to a healthier dairy alternative is something I can feel good about as a mom. I love the taste of almond milk myself, but we tried an off-brand once and Jaden just wasn't a huge fan. I had a feeling this challenge would be the perfect opportunity to change his mind. 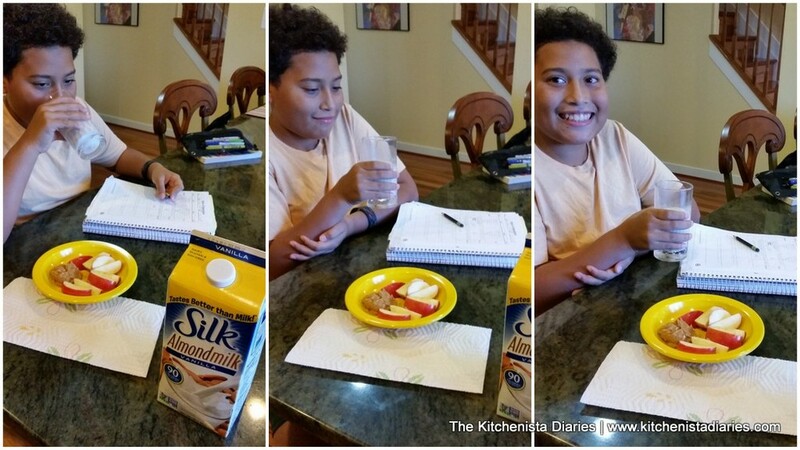 #TasteSilkAlmond, part two: I poured Jaden a glass of Silk Vanilla Almondmilk with his after-school snack. We have a winner here folks! I'm both relieved and excited to get back on track with providing some healthier options for my family. 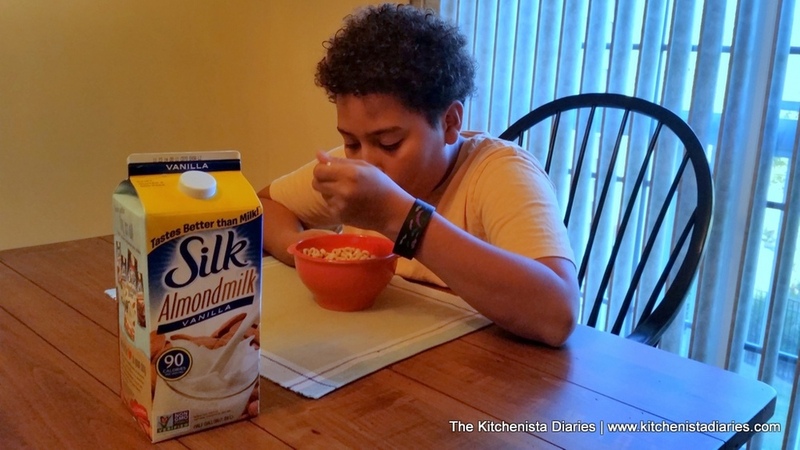 I've also gotta tell you that Silk Vanilla Almondmilk isn't just great for drinking - it's a delicious option to substitute for dairy milk in most of your favorite recipes. Ready to challenge somebody you know to taste Silk Vanilla Almondmilk? You can find out where to buy Silk Almondmilk in your area here: http://silk.com/where-to-buy. If you sign up for Silk's newsletter, you'll also receive a free coupon to try Silk yourself, plus a chance to win new prizes monthly! This is the first post I'm doing that's an update to one of my older recipes. It's something I've wanted to do for awhile but I get so caught up on the new stuff that working backwards rarely seems quite as appealing! As a blogger, one of the cool things about having your work documented is being able see your progress over time. Sometimes I look back at old posts and think yikes...I said that? Others aren't too different than what I would cook today, but the photographs and plating aren't up to par with the quality I know I can produce now. I decided I'd make an occasional visit back in time to redo some recipes I felt would benefit most from a face-lift. 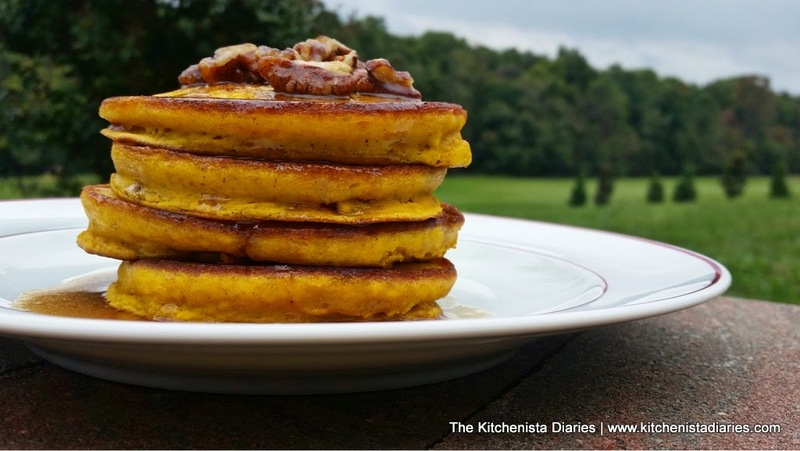 And since just the other day, somebody tweeted that they (successfully) made my old pumpkin pancake recipe... it reminded me that this is one I could easily rework! I am deep into pumpkin recipe testing these days and will tell you that this is a recipe that doesn't benefit from fresh pumpkin. I tried it both ways, to be sure. 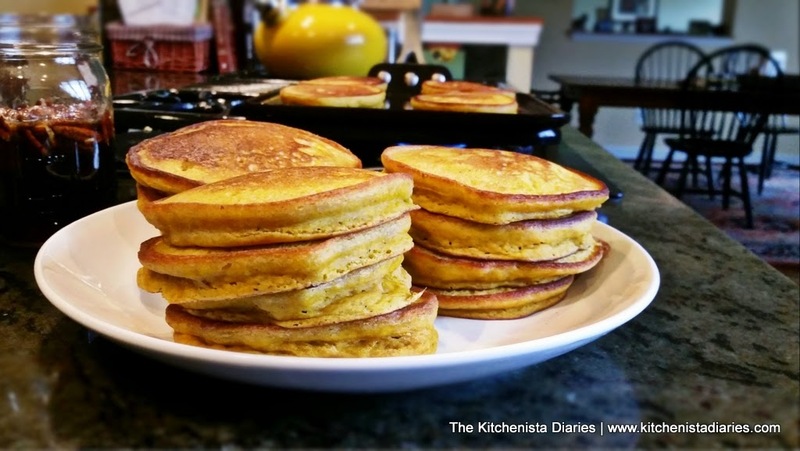 I used some leftover roasted pumpkin (from pie testing, of course) and added that to my first batch of pancake batter. As soon as I mixed them I knew I was going to be disappointed because the color just turned a boring brown. 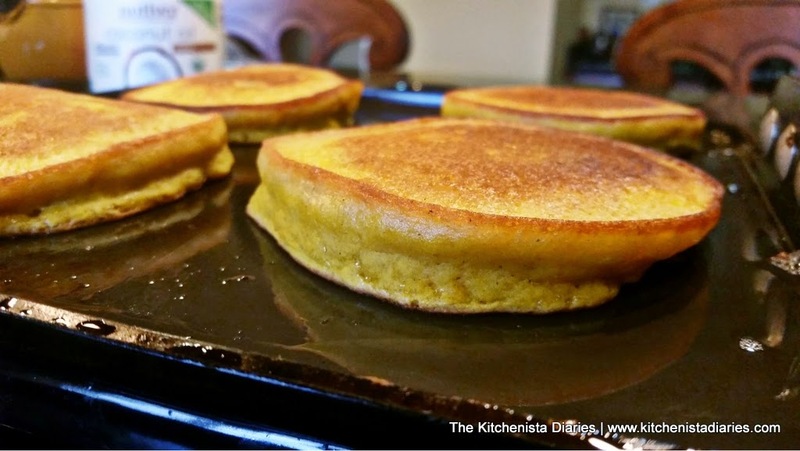 The end product tasted fine but I'd describe the flavor more as a spiced pancake versus a pumpkin pancake. The pumpkin just didn't come through, probably because the canned stuff is a lot more concentrated. 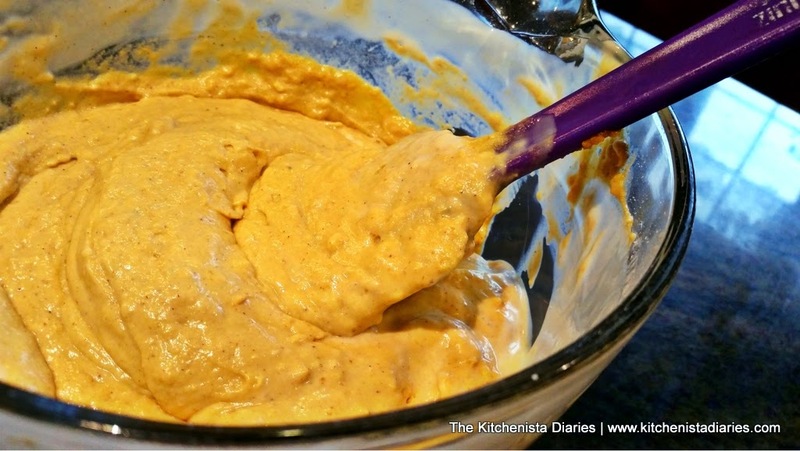 I had similar results with my pie testing and found that cooking the fresh pumpkin puree helped to intensify the flavor. But who wants to take that extra time for pancakes? Not this girl. The biggest differences in this recipe from the original post are that I'm using buttermilk and a lighter flour. At the time I wrote my older post, I had cut back on my dairy consumption significantly so coconut milk was my substitution of choice. Nowadays, as you're probably well aware by now, I sing the praises of buttermilk. The tang and thick consistency just makes it perfect for baking. Low fat buttermilk is perfectly fine to use here and is most likely all you're able to find in your grocery store (unless you're lucky enough to get the real stuff, in which case I'm ridiculously jealous.) As for the flour, White Lily saves the day in keeping these light and tender despite the addition of pumpkin puree to the batter. 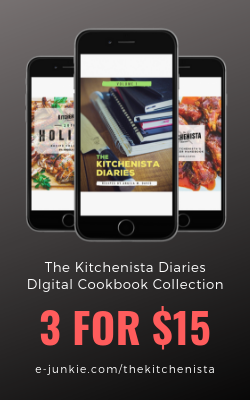 For my non-southern cooks, check out the links below to order some for yourself and taste the magic! Otherwise, a substitution of half cake flour will get you close. 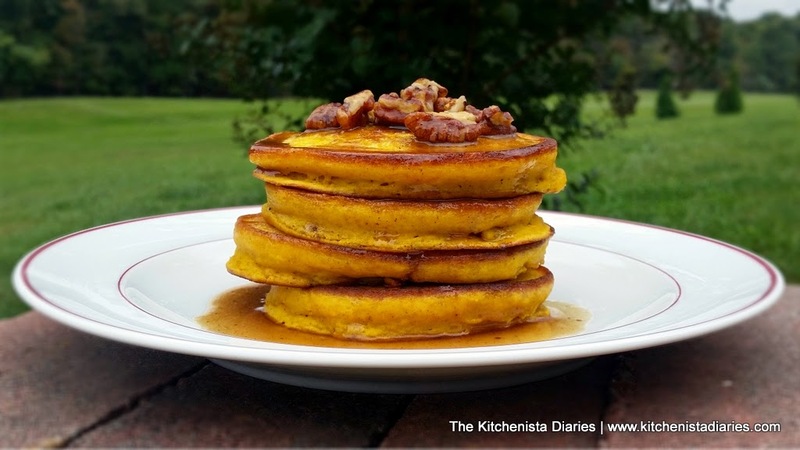 Fluffy, tender pancakes packed with pumpkin flavor and finished with a buttery spiced maple syrup and toasted pecans...does it get more perfect? 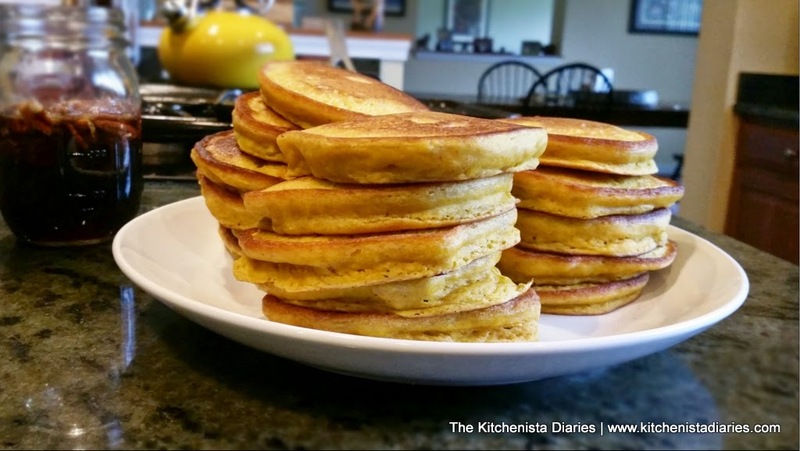 These pancakes were made for the fall, but I have a feeling some of you dedicated pumpkin spice lovers will enjoy them all year long! 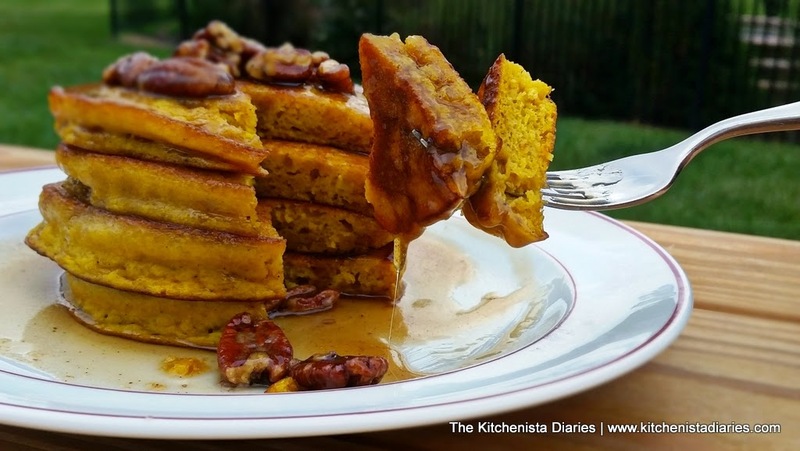 Make your pumpkin spice blend first and set it aside. 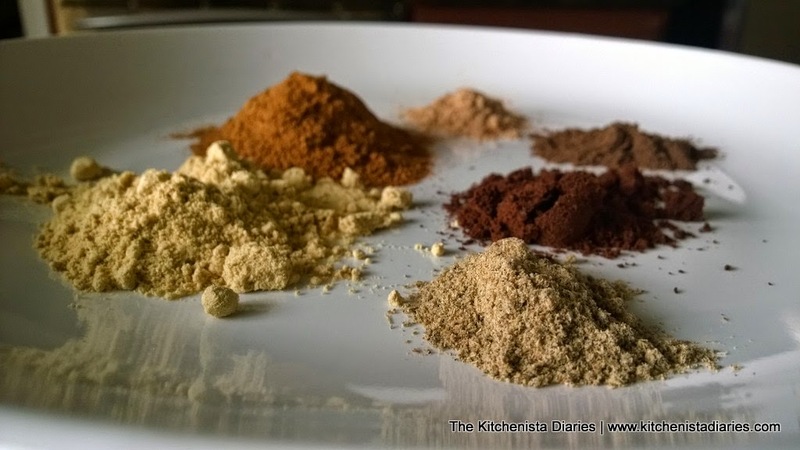 Simply mix all the spices together and store in an airtight container. Use this in any of your favorite recipes calling for pumpkin spice! The cardamom is new for me this year and adds a really nice warmth to the blend. Always grate your own nutmeg, it will have full flavor as opposed to something that's been sitting in a jar forever. The syrup can also be prepared ahead of time. 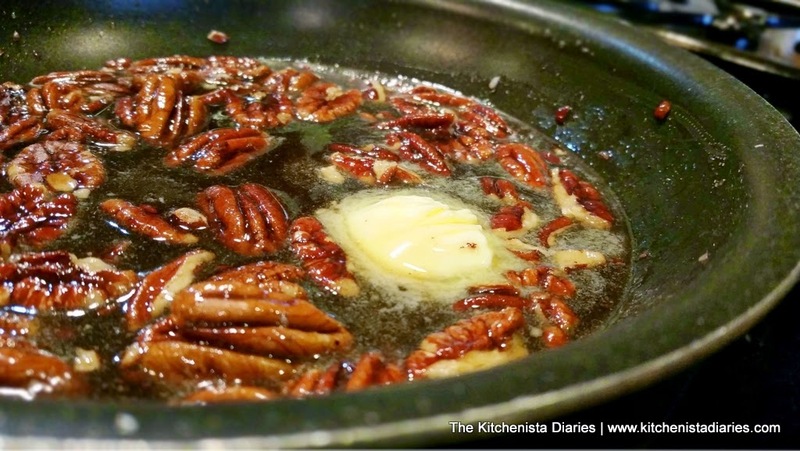 Start by toasting your pecans in a dry pot or skillet. This will only take a couple minutes, so keep an eye on it to prevent scorching. 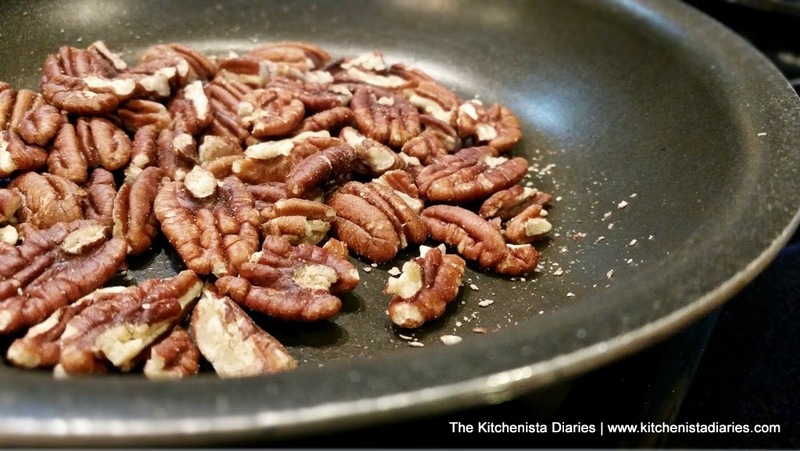 When you can smell the warm pecans, they're done. 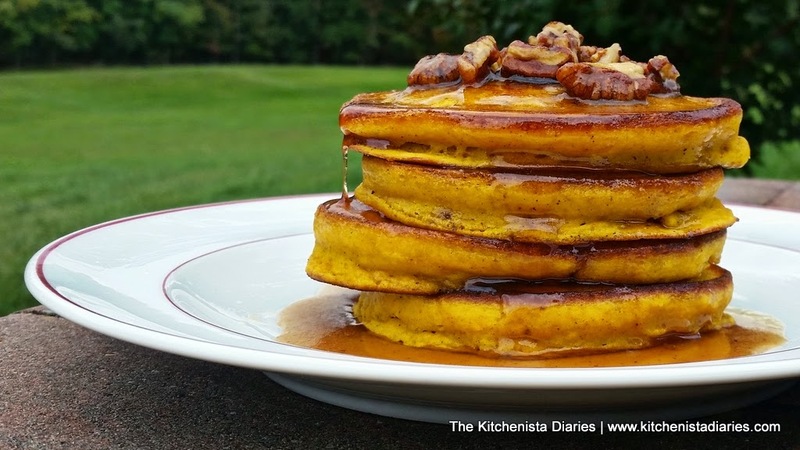 Pour in your maple syrup and stir in a hefty pinch of pumpkin spice. Once the syrup has warmed through, stir in a pat of cold butter. Turn off the heat and either set aside or transfer to a small mason jar for storage. You'll want to refrigerate any leftover syrup. 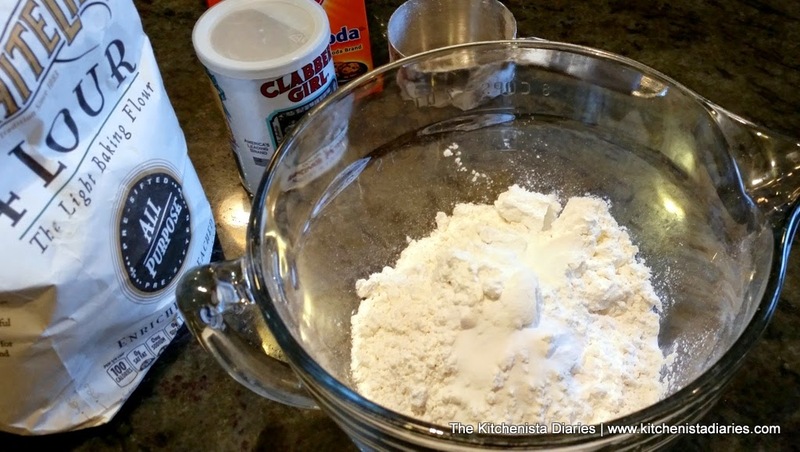 Whisk together your dry ingredients - flour, baking powder, baking soda and salt. If you don't have White Lily, use half regular AP flour and half cake flour. 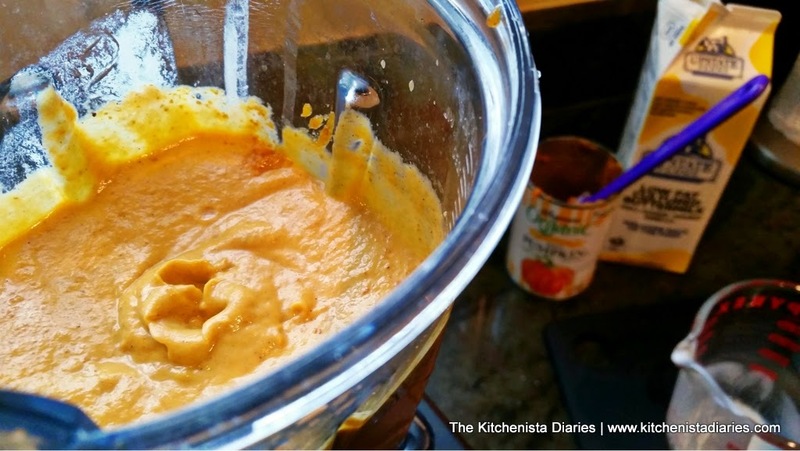 In your blender, add the eggs, pumpkin puree, 2 teaspoons of pumpkin spice, eggs, brown sugar, 2 tbsp maple syrup, vanilla extract, orange extract and melted butter. Add just 3/4 cup of the buttermilk. Blend on high speed until puree is smooth. Gently fold the wet ingredients into your dry ingredients. 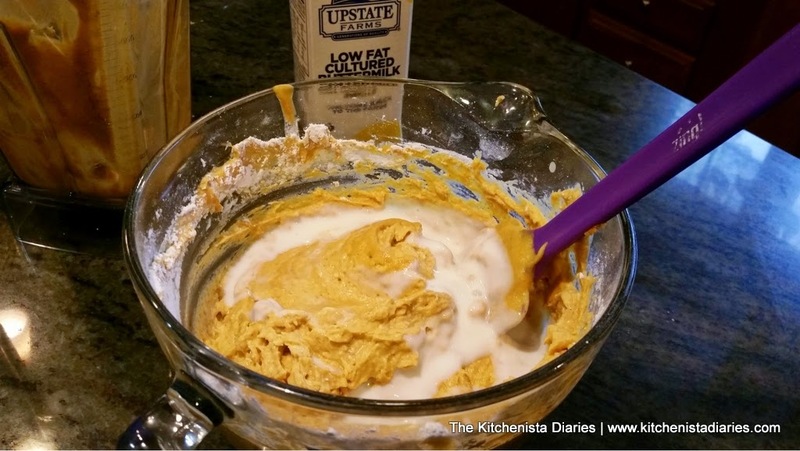 I use a whisk first then switch to a rubber spatula to scrape the sides of the bowl. If the batter is too thick, add enough of the remaining buttermilk to get to the desired consistency. Don't stir your batter to death or you'll end up with tougher pancakes. A few lumps will remain! Because of the pumpkin, it will be a little thicker than usual. Easy so far, right? I told you it would be nothing complicated. By this point you can preheat your griddle. It's ready when a splash of water makes droplets that scatter over the surface of the griddle. If the water sizzles and quickly evaporates, it's probably too hot. The ideal temperature for this recipe will be somewhere between medium and medium high, depending on your stove top and equipment. I like to test one pancake before I proceed with the rest of the batter. It really helps to check if your batter is the right consistency and griddle is at the perfect temperature. Grease your griddle so that it's thinly coated with oil. Coconut oil is perfect for this recipe. The subtle sweetness works here, and it's great at high temps. I use 1/4 cup at a time for each pancake. My test pancake was a little too thick, and the griddle needed to be turned down a notch. What happened here is that the surface of the pancake was browning faster than the inside could cook all the way through. To fix that, I simply added a splash more buttermilk to my batter, and I turned the heat down to medium on my griddle. Now we're cooking. The rule of thumb when cooking pancakes is to flip when you see bubbles on the surface. 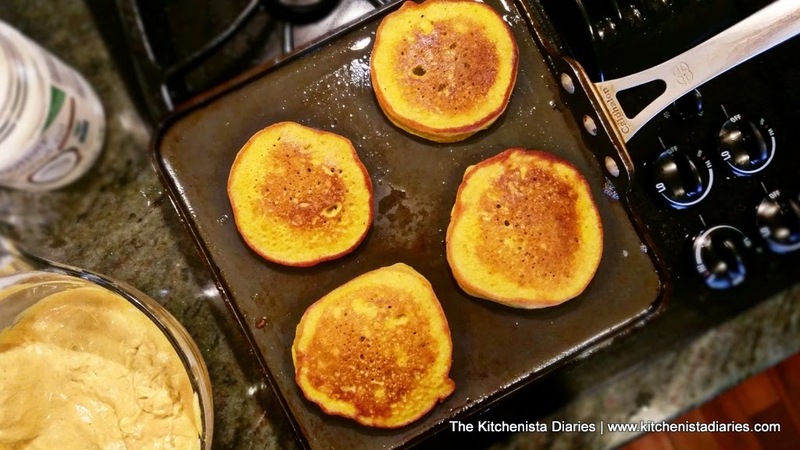 Well, these pumpkin pancakes have a thicker batter so that might not be as easy to see. Instead, I watch the bottom of the pancake. You can see it start to get golden brown as it crisps, and that's when I know it's time to flip. Because of the leavening agents, the pancakes will also start to puff up a little so that's another indicator for doneness. Use your spatula to flip each pancake over in one swift motion. If I can do this with a baby in tow, so can you. These probably took 5 to 7 minutes total to cook per batch. 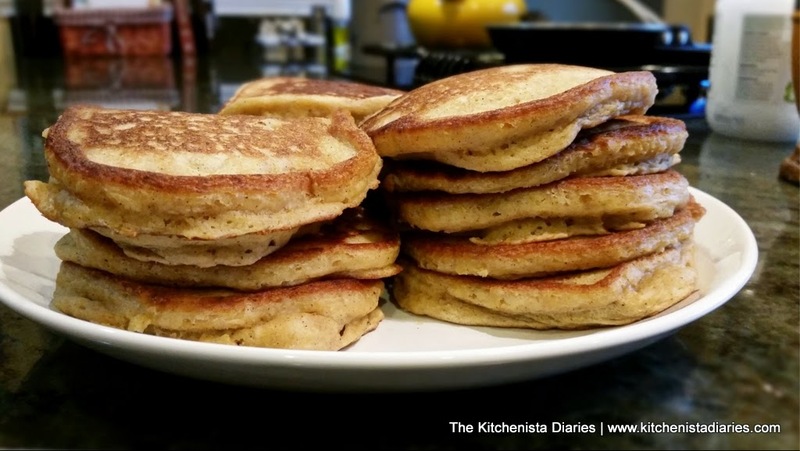 It's definitely a slower cook then most pancakes because of the slightly lower heat, but the result is pancakes that are cooked all the way through and still golden brown with that perfectly crispy rim. Maybe it's because I really have to get in there to take good photos, but I love watching my food cook. It's like witnessing the magic unfold before your eyes. Especially pancakes. Stack these babies up as they come off the griddle. If you want, keep them warm in the oven until it's time to serve. 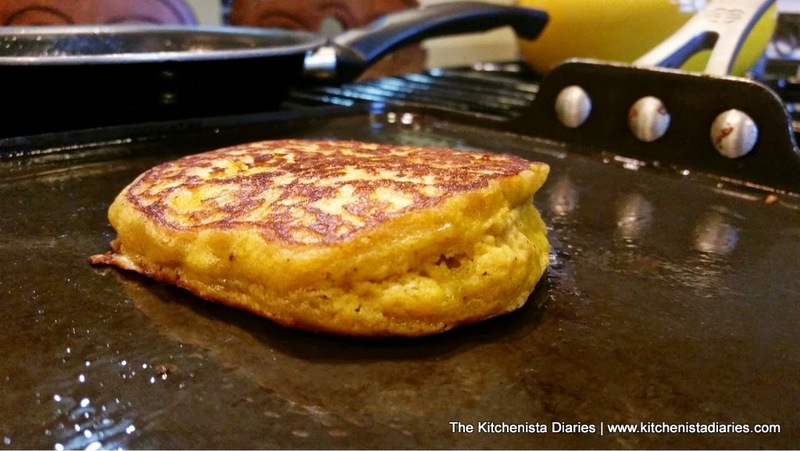 Always let your griddle reheat in between batches and grease it with additional coconut oil. You might be wondering what in the world I do with all these pancakes as I test recipes. Well, they freeze really, really well. I wrap them up in pairs in aluminum foil and then store them in freezer bags. Unwrapped, they take mere minutes to heat up in the microwave so it's an easy breakfast for my son before school! When it's time to dig in, pour a little bit of that deliciously spiced maple syrup over top. I didn't think these needed anything else, not even butter. They are decadent and the perfect fall treat. Enjoy!